1. Where all are The HDFC Schools located? The HDFC Schools with its best academic and all round activities are currently located in three cities. Our flagship school in Gurgaon was launched in 2014 with its first session starting in March 2015. Pune was launched in December 2016 with its first session being 2017-18. Bengaluru school has been launched in November 2017 with its first academic session starting in June 2018. 2. With which board is your school affiliated? 3. What are the facilities that the school provides? The spaces at The HDFC Schools have been designed keeping in mind the future learning needs. Be it the reading or art corners and the co-curricular activity rooms, all come together to make the campuses safe and secure, creating a dynamic ecosystem for young developing minds. Thoughtfully and aesthetically designed to provide meaningful and engaging interactions with the environment, we believe that our vast Green Spaces reignite the love for nature, thereby instilling a strong sense of responsibility. The facilities and infrastructure of The HDFC Schools resonate with its vision, motto and philosophy. There are a variety of child centric spaces, especially designed to provide rich, stimulating environment for personalized as well as collaborative learning. These differentiated, inter-related and adaptable spaces promote active learning and facilitate different modes of teaching -learning experiences. For more details, you could go through the Facilities section on our website, explaining our facilities in a detailed manner. 4. What are the medical facilities available at The HDFC School? Health and fitness of our students is of paramount importance and medical care is a top priority at The HDFC Schools. We have professionally managed and well-equipped Infirmaries in our school. Our experienced medical personnel maintain comprehensive medical records for all our students. They also educate our students and the parent community on topics of general health, nutrition and hygiene by conducting regular workshops and in-house trainings. We also have emergency medical arrangement with the nearby hospitals that could be used in case of rare emergency situations. 5. Is there school transport available? Yes, school transport is available on certain specific routes. We work out our bus routes to accommodate all students. 6. What is your fee structure? Our fee structure varies for classes. We are very transparent about our fee structure and the same is mentioned clearly on our website/ Admissions Guidelines Sheet for all the locations. 7. Do you have Day Care Facilities? Yes, we have Day Care facilities available on all our locations only for The HDFC School children within the school premises. 8. Do you accept applicants from other boards? Yes, we do accept students from other Boards in Primary and Middle Years. 9. What is the curriculum and pedagogy followed by the The HDFC Schools? The curriculum is ingeniously designed to enhance creativity, collaboration, communication skills and team ethics. Our subjects don’t exist in isolation, nor does our learning. Field- trips, excursions, movies, workshops, projects, meeting authors and experts from different fields constitute our academic framework. We adopt a constructive approach and pedagogy with project based learning and hands-on experience as its areas of prime focus. Integrated, collaborative and interactive approach help the students to apply their knowledge in real-life situations and contribute to their holistic development. The students learn to critically evaluate, analyze and express themselves. The overall environment is conducive to fostering Academic Excellence and Creative Brilliance. For more details, you could go through the Education section on our website which gives a comprehensive insight into the curriculum and pedagogy. 10. Is there a third language taught at The HDFC Schools? Yes, a third language is taught at all The HDFC Schools. 11. How does the school ensure adequate hygiene for its students? We have housekeeping staff, both men and women who take care of the entire cleaning of the campuses. We also have dedicated housekeeping staff for cleaning the washrooms ensuring complete hygiene. All essential facilities are provided in all children washrooms, not compromising anywhere on the hygiene front. 12. How does the school ensure adequate safety and security for its students? All our campuses are under CCTV surveillance as per the safety and security norms laid down by CBSE and respective state departments of education. We have all mandatory committees dedicated to the cause of ensuring safety and security for all our children and staff and they are closely monitored for meeting the guidelines and norms laid down by CBSE. We follow the Surakshit Vaahan Policy and ensure that all guidelines laid down by CBSE, DOE and the Honourable Supreme Court of India are implemented. Apart from this, buses are equipped with speed governors, GPS and CCTV cameras and there is live monitoring of all these buses while they are plying on their respective routes. We have trained lady marshals who accompany the children in buses, until they are safely handed over to their parents. 13. 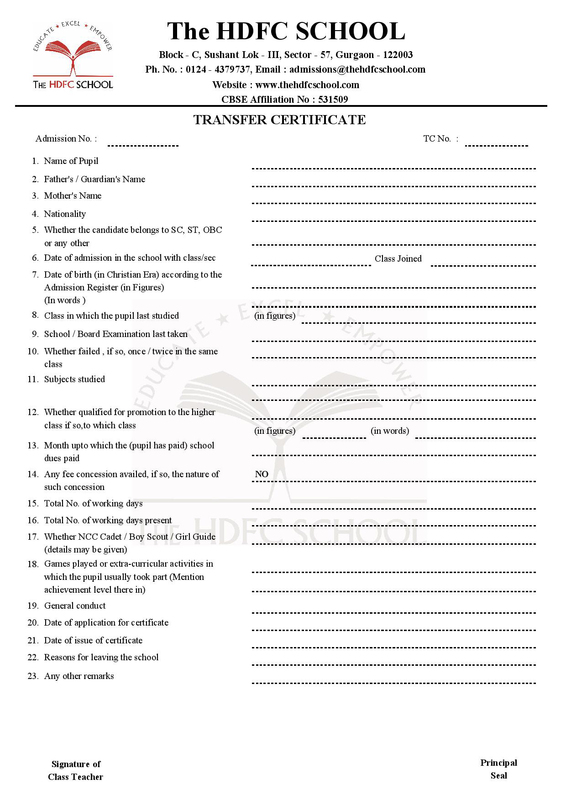 In case of transfer, what is the process of collecting the Transfer Certificate? Parents need to submit an application addressed to the Principal with the reason for withdrawing the child.